The Current USA Orbit Marine is the industry's first LED lighting system to employ dual daylight and dual actinic LEDs. Combining 8,000K/12,000K and 445nm/460nm multi-chip LEDs, this state-of-the-art fixture produces the ideal spectrum for marine fish, invertebrates, live rock, and corals. Its brilliant output dramatically enhances color and fluorescence, promotes active coral growth, and creates a mesmerizing underwater shimmer. The use of 120 degree internal reflectors on each LED chip ensures even light distribution and color blending throughout your aquarium. Paired with the included Ramp Timer Pro Controller, this 24 hour lighting solution empowers marine aquarists with exceptional performance and customization. The Ramp Timer Pro LED Controller is the secret to unlocking the tremendous potential of your Orbit Marine Lighting System. Much more than just a timer, this sophisticated unit allows you to fully customize the fixture's output to suit your schedule and the unique needs of your aquarium. Inspired by nature, it can be programmed to simulate gradual sunrise, sunset and moonlight conditions, while also offering a selection of dynamic weather effects. The Ramp Timer Pro features an easy-to-read backlit LCD display, and includes a powerful 28 button wireless IR remote which offers you full control of our Orbit Marine fixture from a distance. A single remote can be used to control multiple fixtures. The dual channel Ramp Timer Pro allows you to control the brightness and color of the daylight (white) and actinic (blue) LEDs independently. Create and store up to four custom light profiles or simply select one of the two pre-programmed schedules. Two acclimation programs are also available to help your fish and corals adjust to the brilliant world of LED lighting. In the event of a power outage, the Ramp Timer's battery backup will automatically store all your settings and custom schedules. Programming Feature Guide: - Program on/off times for each channel - Adjustable intensity (0 - 100%) for each channel - Adjustable ramp up (sunrise) / dim down (sunset) (0 - 30 minutes) - Adjustable moonlight duration (0 - 6 hours) - On-demand color spectrum adjustment - On-demand weather simulation (2 cloud cover, fading moonlight, and lightning storm) - Four memory slots for custom lighting schedules (pre-programmed by default) Pre-Programmed Lighting Schedule Guide: Timer M1 - 10 hours full intensity, 15 minute sunrise/sunset, with 4 hours of 10% blue moonlight. This is a great lighting schedule for most aquariums. Timer M2 - 7 hours of low/medium intensity lighting, 30 minute sunrise/sunset, with no moonlight. A perfect coral acclimation program. Run this for a few days when adding new corals. Timer M3 - 12 hours full intensity, 15 minute sunrise/sunset, with 4 hours of 10% moonlight. A longer lighting schedule for power growers. Timer M4 - 7 hours of medium/high intensity, 30 minute sunrise/sunset, with no moonlight. Great for fish and coral acclimation. Run for a couple days when adding new fish, invertebrates, or corals. (9) x 8,000K LEDs. (27) x 12,000K LEDs. The Orbit Marine features an attractive, low-profile design. To ensure a perfect fit, the Orbit Marine comes with fully adjustable mounting legs designed to accommodate aquariums ranging from 18" to 24" in size it even fits frameless aquariums! This energy-efficient lighting system draws a modest 18 watts, and includes a low voltage cULus listed power supply. The Current USA Orbit Marine LED Lighting System is designed specifically for saltwater applications. It features a high ratio of blue to white LEDs (50/50) to ensure that corals and other photosynthetic organisms receive the proper wavelength for optimal coloration and growth. It is recommended for saltwater fish, fish only with live rock (FOWLR), and reef aquariums with soft corals such as mushrooms and polyps. Use multiple fixtures for more light demanding LPS and SPS corals. 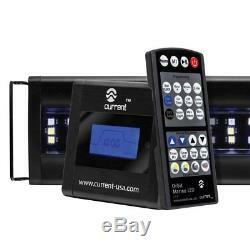 The item "Current USA Orbit Marine LED Saltwater Reef Lighting System 18 to 24" is in sale since Friday, July 22, 2016. This item is in the category "Pet Supplies\Fish & Aquariums\Lighting & Bulbs". The seller is "big-als-pets-us" and is located in Buffalo, New York. This item can be shipped to United States, Canada, United Kingdom, Denmark, Romania, Slovakia, Bulgaria, Czech republic, Finland, Hungary, Latvia, Lithuania, Malta, Estonia, Australia, Greece, Portugal, Cyprus, Slovenia, Japan, China, Sweden, South Korea, Indonesia, Taiwan, South africa, Thailand, Belgium, France, Hong Kong, Ireland, Netherlands, Poland, Spain, Italy, Germany, Austria, Russian federation, Israel, Mexico, New Zealand, Philippines, Singapore, Switzerland, Norway, Saudi arabia, Ukraine, United arab emirates, Qatar, Kuwait, Bahrain, Croatia, Malaysia, Brazil, Chile, Colombia, Costa rica, Dominican republic, Panama, Trinidad and tobago, Guatemala, Honduras, Jamaica. Dimension: 16.8" x 3.5" x 0.44"